I'm trying out Bloglovin as a replacement for Google Reader which goes bye bye in just a couple days. Sigh. I'm also trying out Feedly but so far I'm not sure which one will be my go to source for following all of the blogs on my feed. Any feedback on which of these two you like and why would be appreciated. Early in 2005 I discovered craft blogs. What an amazing community of like minded folk. I didn't know too many people in real life who loved to sew, quilt, make dolls or draw as I do. After a while you really need to get that cheering section from fellow artists. Blogging sounded like an excellent addition to my artwork. 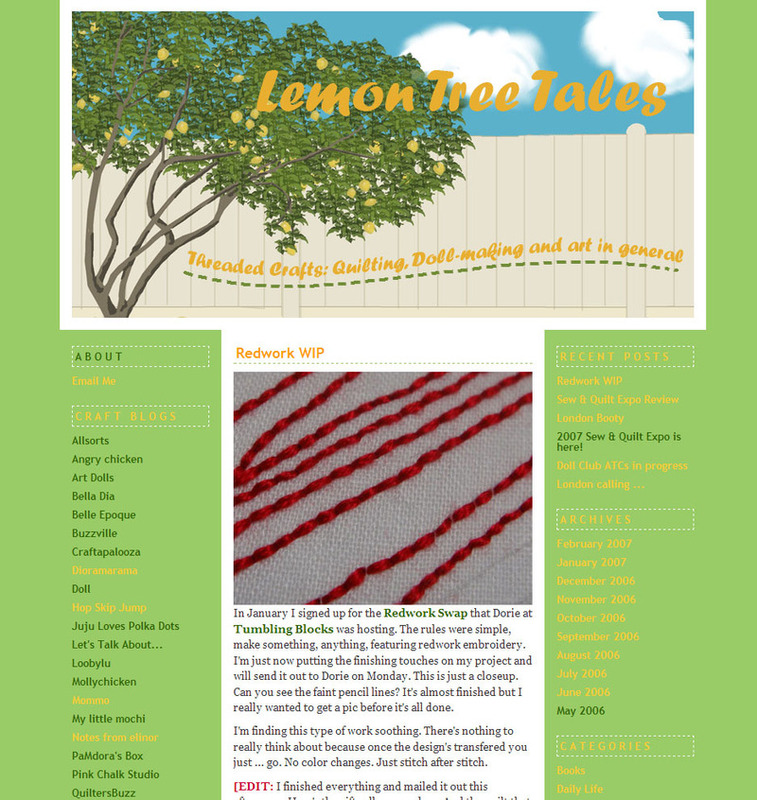 So in February 2006, just a year after discovering blogs, I started Lemon Tree Tales. Since then I've met some great people online, a few in real life and have expanded my circle of local artist friends. Yes, my posts ebb and flow depending on how busy I become. But it's still there to welcome me back as if I had never been away. No pressures, just open arms. That's my definition of blogging for bliss. I made this little flat paperdoll (with papers, ribbons, rhinestones, and vintage millinery trim) in a doll workshop with a few of my local doll artist friends. What fun! ArtsyMama's Blogging for Bliss ... visit to read more about why people are blogging for bliss. And check out Tara Frey's new book, Blogging for Bliss, available on amazon. The Crafty Homemaker is having a giveaway. She's holding a contest on which blog is your favorite and she's nominated me as one of her choices for this week! Isn't that nice of her? All you have to do is to go to this post (by this Friday) and leave her a comment letting her know who's your favorite blog on her list. Now I would be honored if you choose me, but she does have some amazing people listed there. So I'm just tickled that on her list at all. :-) Two of the items in the giveaway are a handmade picture frame and an angel wing necklace. So go check it out. In the meantime I'm going to try to get some good photographs of the most delightful doll that I received from my Secret Pal at doll club. I can't show you the one that I made, but I can share pics of all of the dolls together. Wow, I can't tell you how floored I was when I saw this post over at Monica's Happy Zombie blog. Yippee, I won her drawing that both was a blogebration and also was an excuse to convince Karen Snyder that she really needs to start a blog. So today this heavy manila envelope made its way to my house ... ah, so much fun to get mail. And look, Karen even signed it for me! She has beautiful penmanship. Gotta love all the swirly action. What's even better is that I have quite a few baby quilts that need to be made. One is for my cousin who's due sometime in June and the other two are for two very special twin boys - sons of Steve's cousin. They made their entrance into this world December 24th (I'm pretty sure) but much, much too early. So they'll have to stay at the hospital for quite a long time. But since they've survived this long they are no longer considered critical. I think that the mom needs to have something to hold on to while she visits with the boys in the neonatal ICU. 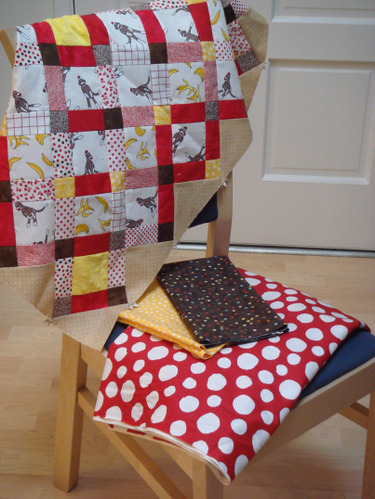 And two little quilts may be just the thing. PamKittyMorning linked to this fabulous giveaway from Robin, the creative force behind Paris Bebe Fabrics. 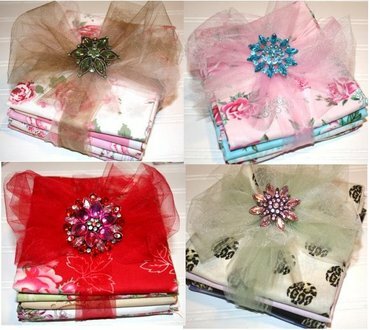 She is having a drawing on Monday to giveaway these four fat quarter bundles from her new line. 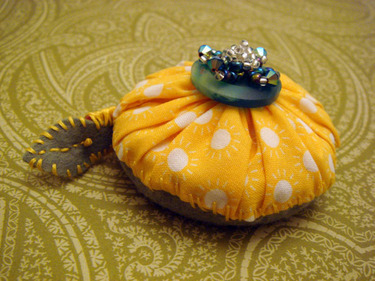 She's also throwing in the beautiful rhinestone brooches and the pattern for her fat quarter apron so that you'll have something to play with right away. Go check it out and sign up while there's still time. Let me know what you think. And of course, as is traditional, I'll enter all who comment to a little prize raffle. The drawing will be next Monday. I'm loving this blog thing. I've met such nice people and have participated in great swaps since I started this a year ago. Here's to more projects in the future. Wow, can you believe that this is my 100th post? I've noticed quite a few people also have made their centennial post within the last couple of weeks. Blogging is such an interesting medium. So far I've tried using it to kick myself into creative gear -- I'm not sure if you've noticed, but uhm, I seem to have a bit of trouble with procrastination. Notice the above evidence, the sock-monkey quilt. This was supposed to be a new-baby gift for Tina's little boy, BEFORE, the birth. Of course that was in September and let's see, now it's January of a whole new year! Somehow I don't think that I'll be able to kick this procrastination habit anytime soon. I know, I'll just jot it down on the to-do list. In the meantime I've been making progress. Here's the quilt's center all pieced. It just needs two borders and to be quilted. The yellow fabric will do double duty as the small inner border as well as the binding. The brown fabric will be the wider outer border and that fabulous red fabric will be the backing. Hmm, did you notice how all three fabrics are polka dots? I must be having a Minnie moment today. Now on to the fun stuff ... since so many people seem to have a drawing in honor of their 100th post, I'll follow that trend. I've been organizing my crafting area and have found, much to my dismay, duplicates! The winner of the drawing will receive this book and other sewing goodies. I'll post the winner next Sunday, January 14th. Now it's time to get those borders cut out. Yippee!!!! I found out that I did indeed sign up in time for BackTack III. (I guess I shouldn't have been too worried since I had three tabs opened in the Mozilla browser: the world clock, backtack, and gmail. I think that I sent off the email within the first 2 minutes.) This should be so much fun. I was so jealous and inspired by all the people's projects for BTs I & II that it was part of the impetus to finally start my own blog. So now I get to figure out what type of softie I should make for Nancy of Belle Epoque just up the coast in San Francisco. I'll have to get out all the lovely black & white fabrics from my stash and see what looks interesting to me. I created a new banner to replace the stock color banner that I had yesterday. As I learn more things about typepad, I'll probably change the look again. But for right now, I'm pretty happy with how this is looking.